Trim tough ends from asparagus, rinse and pat dry. Spread asparagus out over a large baking sheet. Drizzle with olive oil and season with salt and pepper. Sprinkle minced garlic over asparagus and toss all until the asparagus is well coated. Spread evenly over baking sheet. Top with lemon slices. Meanwhile, prepare sauce. Add Holland House® White Cooking Wine to a saucepan and place over medium-high heat. Bring to a boil and cook for 5 minutes. Reduce heat to low. Whisk in butter and sour cream. Add lemon zest and whisk until smooth. 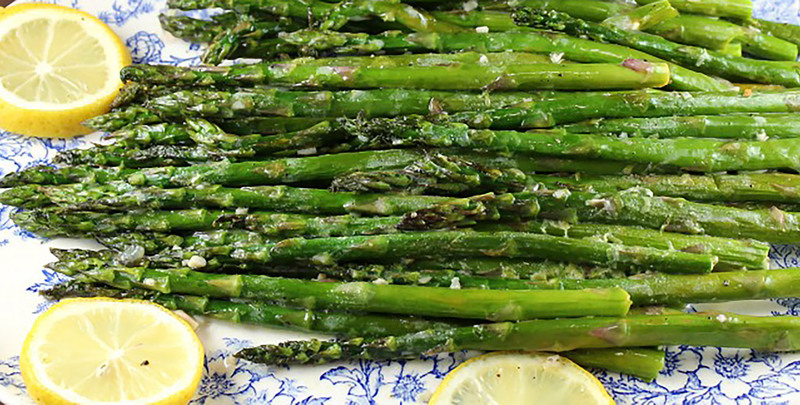 Remove asparagus from oven and squeeze a couple of the lemon slices over cooked asparagus. Place on a serving plate and drizzle with sauce or serve sauce alongside.